We have much to celebrate this Yom Ha’Atzmaut (Israel’s Independence Day). To use one of today’s more popular terms, Israel began as a start-up dream. Groups of Jewish upstarts connected to the nationalist fervor of the late 19th century and began to dream of a Jewish state in Palestine. Theodor Herzl expanded on these nationalist ideals in his writings “The Jewish State” (1896) and “Old New Land” (1902). These early utopian works expounded the Zionist dream for a Jewish and democratic homeland and today, a little more than 100 years later, we celebrate the vibrant and exciting State of Israel. 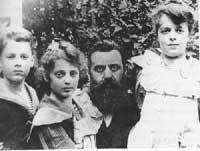 Theodor Herzl and his children, from left, Hans, Trude, and Pauline. None of his children lived to see the creation of the State of Israel. We also celebrate a new breed of Israeli. This is the third generation of Israelis after the establishment of the State of Israel. The first generation was made up of Holocaust survivors, dreamers, and builders; the second included the warriors and planners, and the third generation is made up of entrepreneurs, innovators, and achievers. We are proud witnesses of Israel’s accomplishments in a variety of fields. We see Israelis as leaders in nearly every field of technology, including pharmaceuticals, many fields of research, communications, and alternative energy. While we’re busy celebrating Israel’s 62nd birthday, it is important to spend a moment remembering the founder of modern Zionism, Theodor (Binyamin Ze’ev) Herzl. It seems particularly fitting to remember Herzl at this time because two weeks after Israel’s Independence Day will be the 150th anniversary of his birth on May 2, 1860. Herzl, a Paris journalist for an Austrian newspaper, was deeply disturbed by the notorious Dreyfus trial and its aftermath – large anti-Semitic demonstrations. These events caused a fundamental change in Herzl, who was educated in the spirit of German Jewish Enlightenment as a secular Jew. He began to believe that Jews should leave Europe and create their own independent state. Herzl’s writings were the foundation stones of the dream of a Jewish sovereign state. He was also honored with the name “Hoze Ha’Medinah” – visionary of the State. It is with sadness that I learned that Herzl has no living relatives, only one family member ever visited Palestine, and no one related to him saw his Zionist dream fulfilled. Herzl was married to Julie Naschauer in 1889; it was said to be an unhappy marriage. They had three children, all of whom died tragically. His eldest daughter, Pauline, suffered from mental illness and died of a morphine overdose. His son Hans committed suicide the day after Pauline’s funeral. The younger daughter, Trude, married and had a son, Stephan Theodore Neumann, Herzl’s only grandson. She died in Theresienstadt at the hands of the Nazis. Stephan was sent to England before the outbreak of the war and to escape Austrian anti-Semitism. He anglicized his name to Stephen Norman and enlisted in the British army. Norman was an ardent Zionist and read his grandfather’s writings and diaries. He visited Palestine, under the British Mandate in 1946, “to see what my grandfather started” almost 50 years after Herzl’s only visit there. Stephen Norman, Herzl’s only grandson, did not return to Palestine or witness the fledgling Jewish homeland grow into the modern state of Israel. After the visit to Palestine he was employed by the British government in Washington, D.C. There he learned the fate of his mother and, suffering immensely, he jumped from the Massachusetts Avenue Bridge to his death. Norman was buried in Washington by the Jewish Agency in November 1946. He was reburied with his family on Mount Herzl, in Jerusalem, on Dec. 5, 2007.